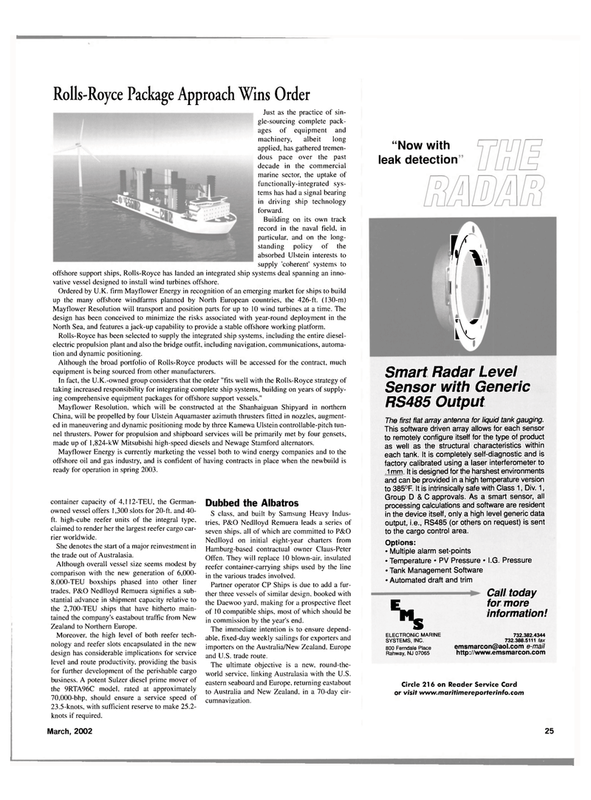 Just as the practice of sin- gle-sourcing complete pack- ages of equipment and machinery, albeit long applied, has gathered tremen- dous pace over the past decade in the commercial marine sector, the uptake of functionally-integrated sys- tems has had a signal bearing in driving ship technology forward. Building on its own track record in the naval field, in particular, and on the long- standing policy of the absorbed Ulstein interests to supply 'coherent' systems to offshore support ships, Rolls-Royce has landed an integrated ship systems deal spanning an inno- vative vessel designed to install wind turbines offshore. North Sea, and features a jack-up capability to provide a stable offshore working platform. Rolls-Royce has been selected to supply the integrated ship systems, including the entire diesel- electric propulsion plant and also the bridge outfit, including navigation, communications, automa- tion and dynamic positioning. In fact, the U.K.-owned group considers that the order "fits well with the Rolls-Royce strategy of taking increased responsibility for integrating complete ship systems, building on years of supply- ing comprehensive equipment packages for offshore support vessels." China, will be propelled by four Ulstein Aquamaster azimuth thrusters fitted in nozzles, augment- ed in maneuvering and dynamic positioning mode by three Kamewa Ulstein controllable-pitch tun- nel thrusters. Power for propulsion and shipboard services will be primarily met by four gensets, made up of 1,824-kW Mitsubishi high-speed diesels and Newage Stamford alternators. Mayflower Energy is currently marketing the vessel both to wind energy companies and to the offshore oil and gas industry, and is confident of having contracts in place when the newbuild is ready for operation in spring 2003. container capacity of 4,112-TEU, the German- owned vessel offers 1,300 slots for 20-ft. and 40- ft. high-cube reefer units of the integral type, claimed to render her the largest reefer cargo car- rier worldwide. She denotes the start of a major reinvestment in the trade out of Australasia. Moreover, the high level of both reefer tech- nology and reefer slots encapsulated in the new design has considerable implications for service level and route productivity, providing the basis for further development of the perishable cargo business. A potent Sulzer diesel prime mover of the 9RTA96C model, rated at approximately 70,000-bhp, should ensure a service speed of 23.5-knots, with sufficient reserve to make 25.2- knots if required. Offen. They will replace 10 blown-air, insulated reefer container-carrying ships used by the line in the various trades involved. Partner operator CP Ships is due to add a fur- ther three vessels of similar design, booked with the Daewoo yard, making for a prospective fleet of 10 compatible ships, most of which should be in commission by the year's end. The immediate intention is to ensure depend- able, fixed-day weekly sailings for exporters and importers on the Australia/New Zealand. Europe and U.S. trade route.